Education and training will always be a win-win situation for both the employer and the employee. With nationally accredited curricula developed for the construction industry, the Pelican Chapter, ABC is training hundreds of men and women in industry related specialties to meet and exceed the most exacting standards in the country. With the clout and knowledge provided by some of the most qualified instructors in the U.S., ABC trained workers tend to receive higher wages, experience more job satisfaction and greater job retention. The employer saves money through an appreciably safer workplace, employee retention, and a significant increase in productivity. For many years, the Pelican Chapter’s Training Centers in Baton Rouge and Westlake, as part of our normal night classes, have offered high school students an opportunity to gain industry based certifications while earning Carnegie Units of credit towards graduation. Although, students can still attend classes at night, in 2008 we began offering daytime dual enrollment for high school seniors meeting graduation requirements in the Spring Semester. 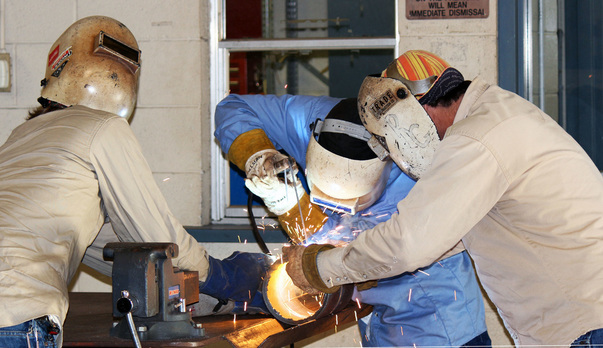 In the fall of 2013 our training center became a Course Choice provider recognized by the Louisiana State Department of Education and offered daytime dual enrollment programs to juniors and seniors in pipefitting, electrical, and welding. In the Fall of 2014 Supplemental Course Academy (SCA) replaced Course Choice and we now offer all crafts but are currently teaching classes in welding, millwright, and electrical. The program has since been brought back to Course Choice and has grown from 34 students to a total of 246 students combining both the Baton Rouge and Westlake campus. The Course Choice students attend classes at one of the Pelican Chapter Training Centers or local high school satellites while taking the academic core classes at their home schools. Tuition for Course Choice students is $550.00 a semester for all classes except welding which is $2,650.00 per year. Click on the logo above to visit Louisiana Course Choice or contact them at 1 (877) 453-2721. Check out this new video by Foundation for Excellence in Education on Ascension Parish Course Choice students and Pelican Chapter, ABC Baton Rouge Training Center.